Are all strollers created equal? Apparently not, as a child known as Collin would definitely evoke a sense of envy among his peers, especially when you take into consideration how he would most probably have the greatest stroller in the world. 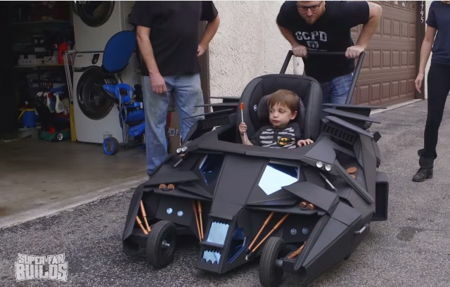 Collin, being a Batman fan himself, takes after his father – which is why they have the a Batman Tumbler stroller that hails from Superfan Builds. It all began with a computer model, before being printed out on paper for accuracy, with the frame making use of steel tubing to come into existence, while the seat is as comfortable as a car seat – for the simple fact that it is one, of course.